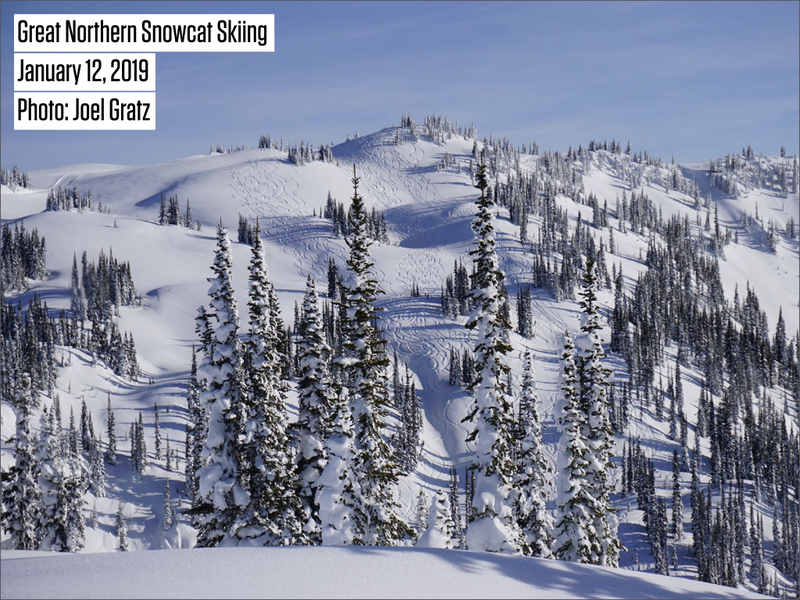 I just spent three days cat skiing at Great Northern Snowcat Skiing in British Columbia (January 11-13, 2019). 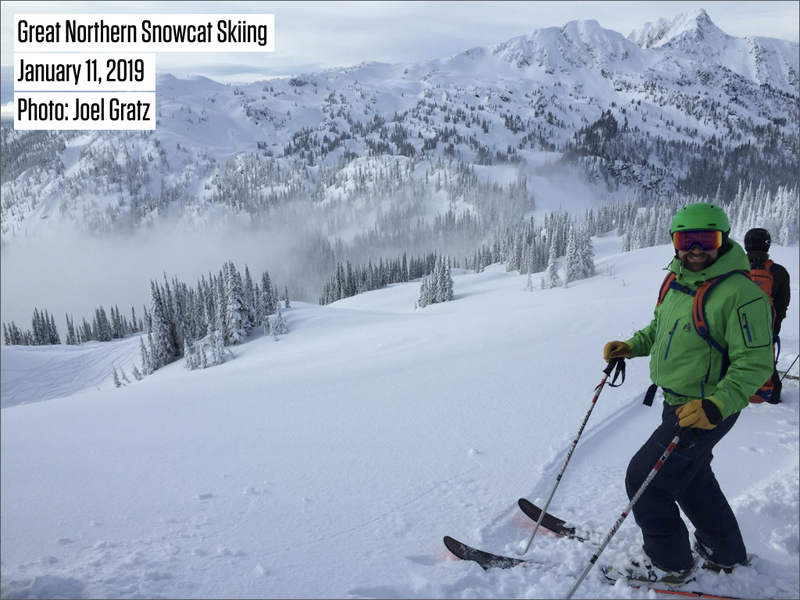 I want to share the experience with you in hopes that it might help you to learn more about skiing in British Columbia, about cat-skiing, and about the operation at Great Northern. If you have questions, I included additional links and contact information at the bottom of this post. 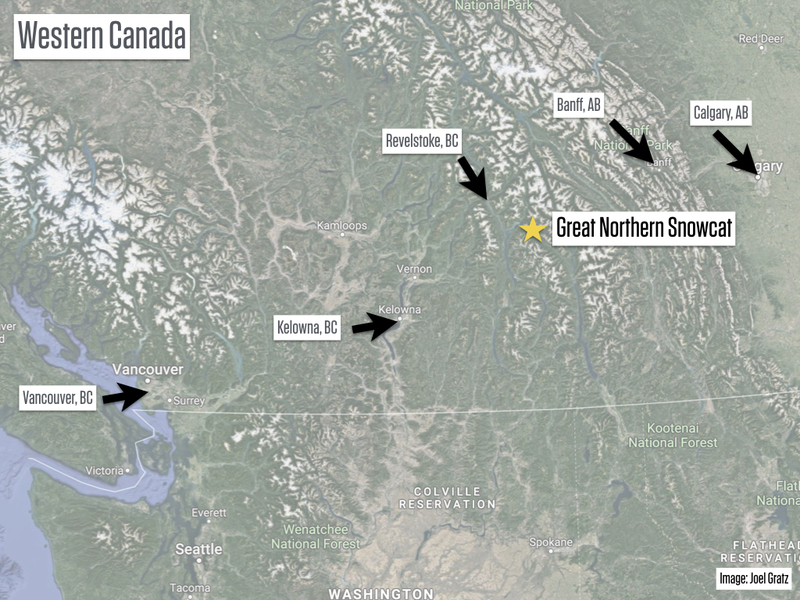 Great Northern is located in the heart of British Columbia’s interior mountains. This is ground zero for deep snow. Their lodge is just off a public roadway, so unlike other cat and heli-ski lodges, you drive your car (or more likely, a rental car) directly to the steps of the lodge. 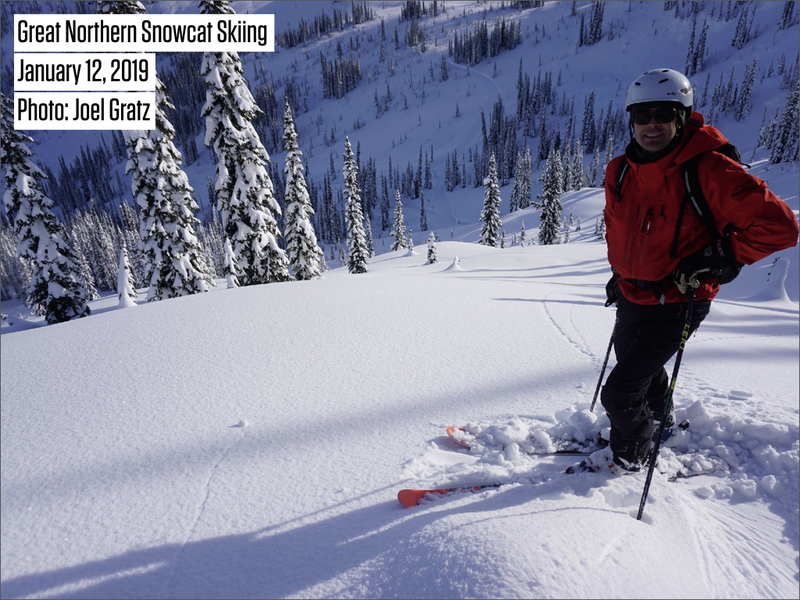 We chose to fly to Calgary, rented a car, and then spent a day skiing at Revelstoke before driving to Great Northern. 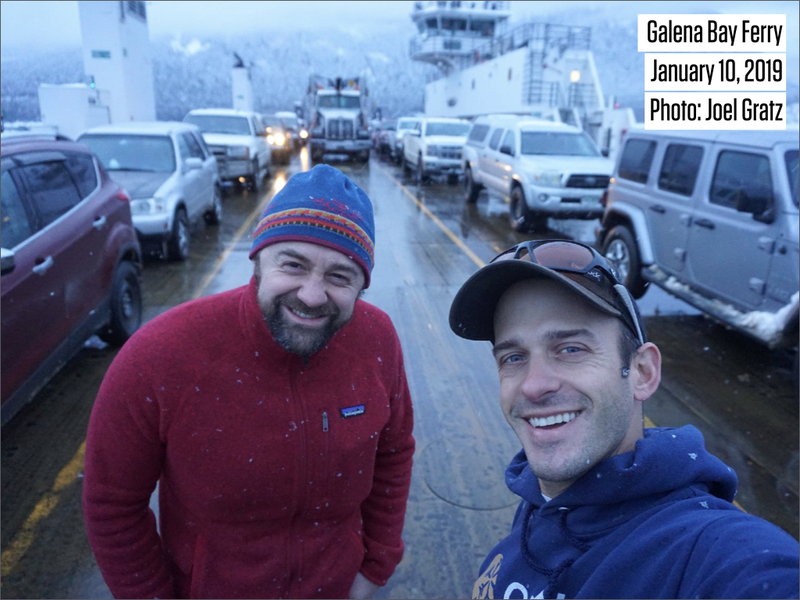 The drive from Revelstoke includes a fun twist – a free ferry from Shelter Bay to Galena Bay. It’s a beautiful 30-minute boat ride, so put your coat back on, get out of your car, and enjoy the beauty of interior British Columbia. 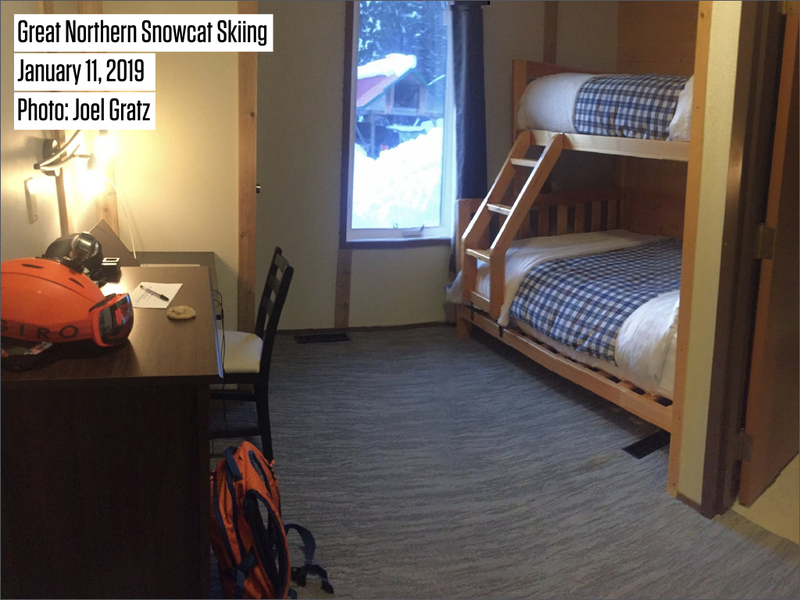 After arriving on the other side of the lake, we drove to the lodge, found our room, and got excited as our first day of cat skiing was only one night away. 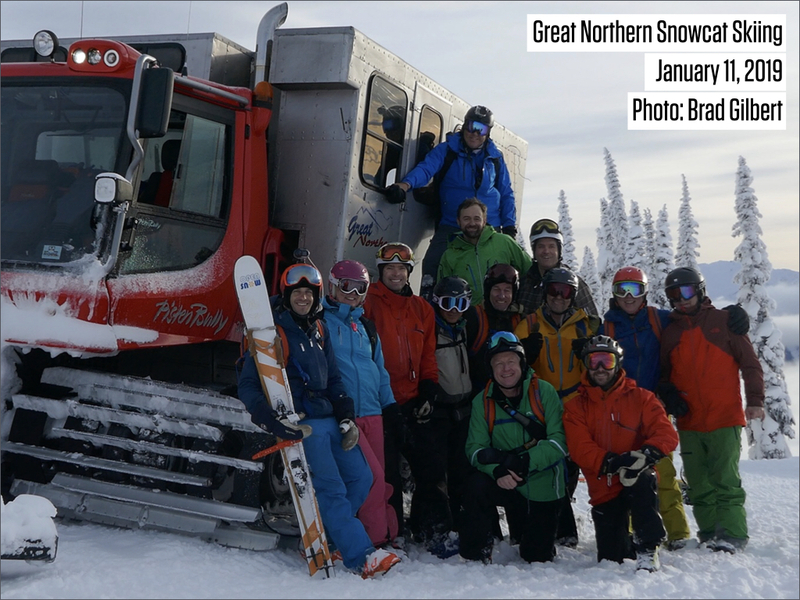 Following breakfast and a morning safety briefing, we boarded the snowcat for a 45-60 minute trip up the mountain. I thought this might feel like a lot of time (almost one hour in the cat before taking a run?) but the minutes ticked by quickly. On the first day, the guides use this time to discuss safety strategies and the program for the trip. On future days, it turned out to be a nice time to have deeper conversations with other guests. When we made it to the ski terrain, two more things needed to happen before we dove into the day’s skiing. 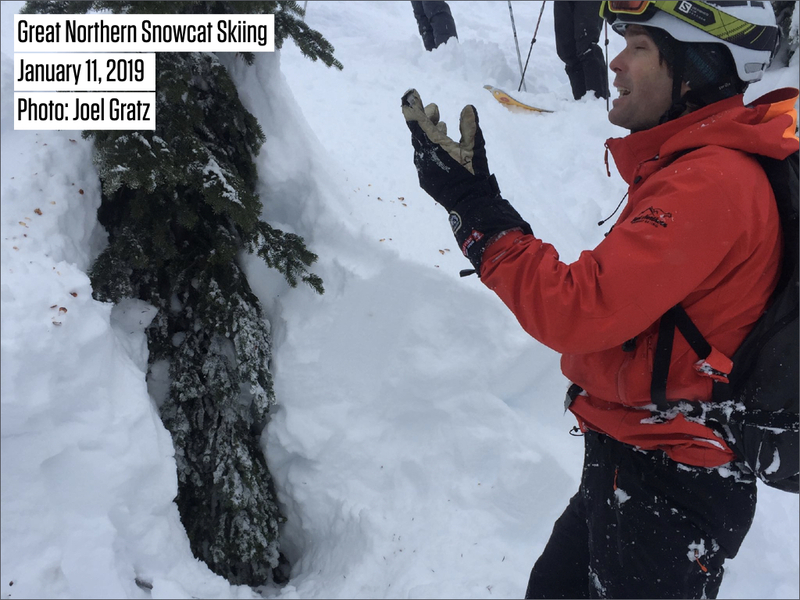 First, our guide reinforced the danger of tree wells, the importance of skiing with a partner, and what to do in the event that a person did go into a tree well. Second, we checked the snow stake. 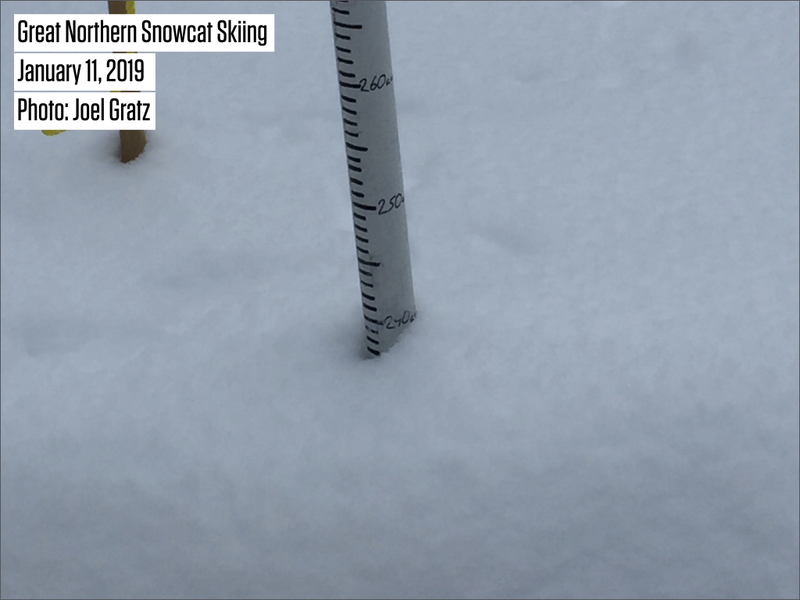 The base depth during our trip in early January 2019 was 240cm, or 94 inches. That’s seven feet of snow between our feet and the ground – plenty of base make for a good time! I’ll keep my description brief and let the pictures below do most of the talking. Terrain options included just-below-treeline zones that were open or with very widely-spaced trees, zones with steeper, tighter, and deeper trees, and zones with burned trees (there are no tree wells in the burned areas as the remaining trees have few or no needles on their branches to catch the snow). Here we are in the just-below-treeline zone about to start a mellow run. 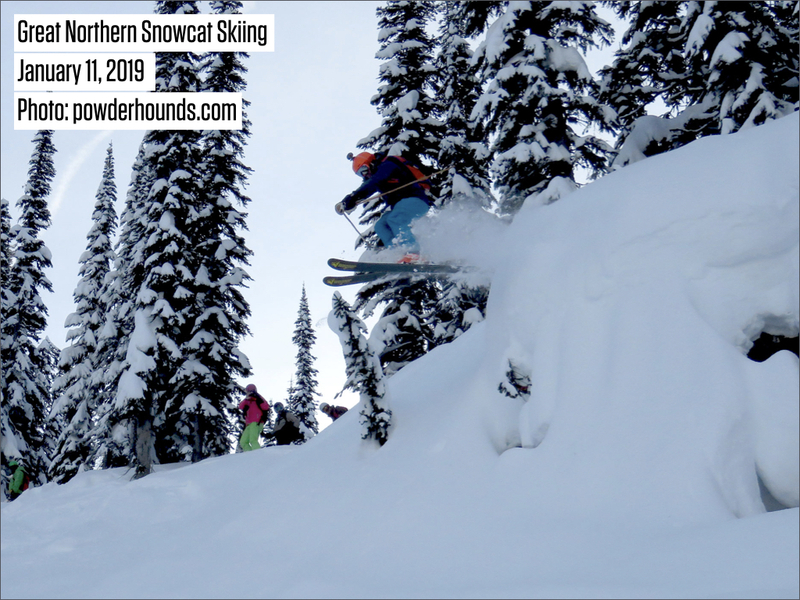 Onward to the low-angle and cruisy powder! The lower-angle terrain allowed us to sometimes ski as a big group (party ski!). Tap the video below to start playback, then drag around the video window to view all 360 degrees of action. If you're on a mobile device, click here to watch the video in the YouTube App, which supports 360-degree playback. As we found our legs under us, our guide pointed the way to a section with more pitch and fun rollovers. Sometimes it’s hard to understand the terrain from above, and luckily, later in the day, we had a nice view of previous ski tracks. You can see the mix of open, lower-angle areas at the top, getting into more trees with more pitch down lower. While the open, cruisy zones are fun, I always enjoy exploring spicier terrain. Below, looking back up the hill, you can see a zone with more features and steep pictures. I was super happy when our guide asked if anyone wanted to get a little air, and then he pointed the way to a small and safe cliff. I’ve been on other guided trips where the guides were reluctant to help myself and others find features. 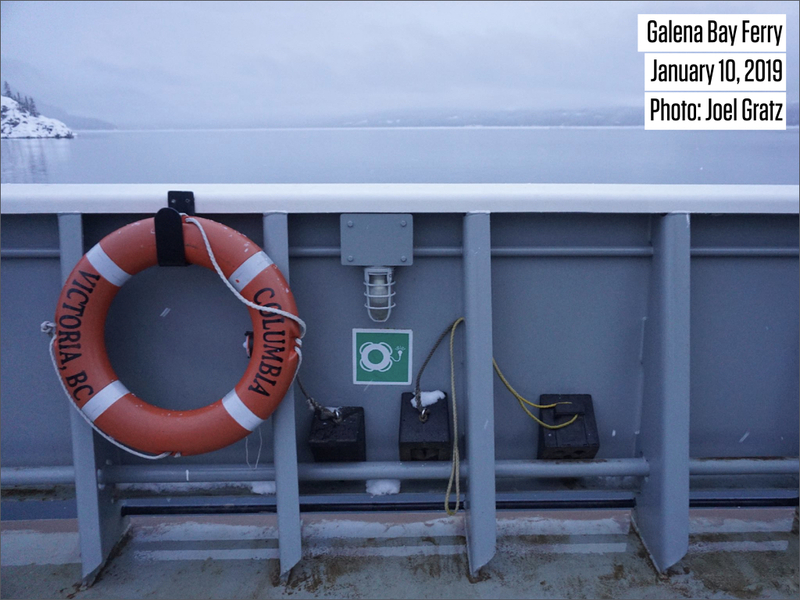 It was the opposite here – optional airs were pointed out to us, and also, the way around the cliffs was pointed out as it was NOT mandatory to get air. 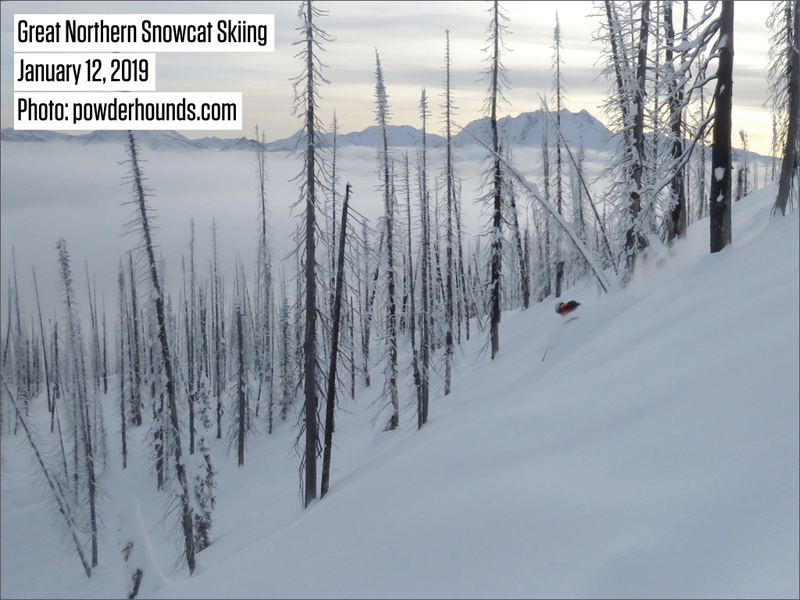 Finally, we enjoyed skiing a few runs in the burned forest, usually early and late in the day as this terrain was close to the area where the cat road from the lodge emerges from the lower forest. It’s super fun ‘chasing’ another guest through the burned forest, with soft, boot-deep powder at your feet! To close out my show-and-tell about the terrain, below is a video of a fast and flowy run. It was a low angle and a pretty long run. Usually, I wouldn’t get jazzed about low-angle terrain, but this was just, well, fast and flowy and incredibly fun! Of course, when you’re out skiing all day, you want plenty of food and drink to keep you hydrated, and this wasn’t a problem. There were plenty of snacks and drinks in the cat, and lunch was enjoyable. 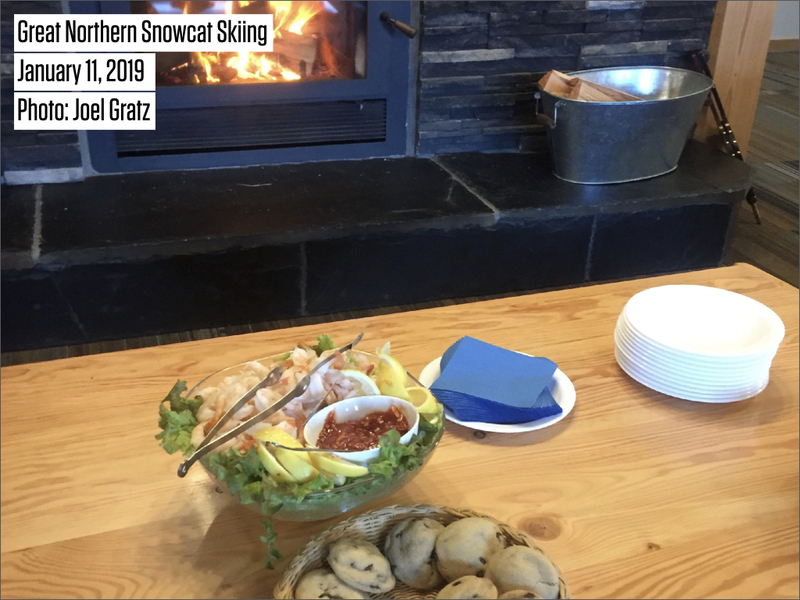 Lunch was NOT ‘over-the-top’ as I’ve seen at other operations, which was fine with me because if you’re not careful, you can eat more calories on these trips than what you burn skiing! Similar to lunch, I felt that the lodge and food were very good, always left me satisfied, and weren’t over-the-top. Appetizers were always ready when we returned from skiing. The common room was small enough to feel intimate but large enough to be able to find your own space. Ooo, and notice the ping pong table and pool table? Yeah! Everyone got their own rooms, which were rustic and comfortable, and all had an ensuite bathroom. * Breakfast was filling, with an assortment of fruits, pancakes, sausage, and other treats. * Dinner was remarkably good, and again, it was just the right amount of food and presentation without being over the top. * Alcohol is “bring your own” (at least for us in early 2019). Stock up before you leave the nearest town! * There was no hot tub. It’s a bit of a bummer, but I’m here for the skiing, so not really an issue. * Wifi was VERY FAST, especially for being in a remote area. I need to go online to view weather data each morning so I can write snow forecasts, and this was never a problem. I was impressed with the speed and reliability of the connection – something to note if you need to be online during your trip. I was always comfortable with the terrain selection and our lead guide’s decision making. This should be true for all major guiding operations, but it doesn’t hurt to reiterate that they did a great job at Great Northern. One thing that I was bummed about was the constant request for our group to farm turns (ski close to each other). I understand that sometimes this is necessary to keep the group together and preserve snow for future runs or future groups, but it did take away from the enjoyment of moving around a little to find my own line. * The entire experience was un-stressed and unhurried. Some operations, especially heli-skiing, need to keep things moving, and this can add a rushed feel to the day. Not here. There was plenty of time and no push to hurry to get into or out of the cat. * The guides did a great job accommodating various skill levels among the group. 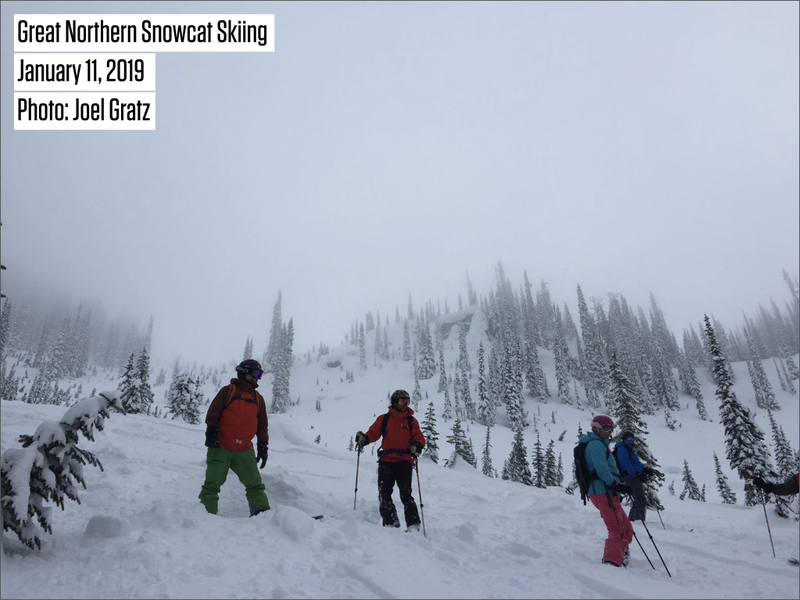 When we skied steeper trees that didn’t appeal to some group members, those folks were given the option to sit out for a run and stay in the cat to rest, or ski mellow terrain next to the cat road. There was no pressure to ski more runs, or in terrain that was over the head of some guests. * This is a smaller operation with only one cat for guests staying at the lodge. On some days, a second “day cat” is added for groups of people that come for one day from Revelstoke (no overnight). Having a small group in the lodge felt good. * One row of seats in the snowcat faced backward. This was not a problem for our group, though I didn’t sit in this backward-facing row as I can sometimes get motion sick. 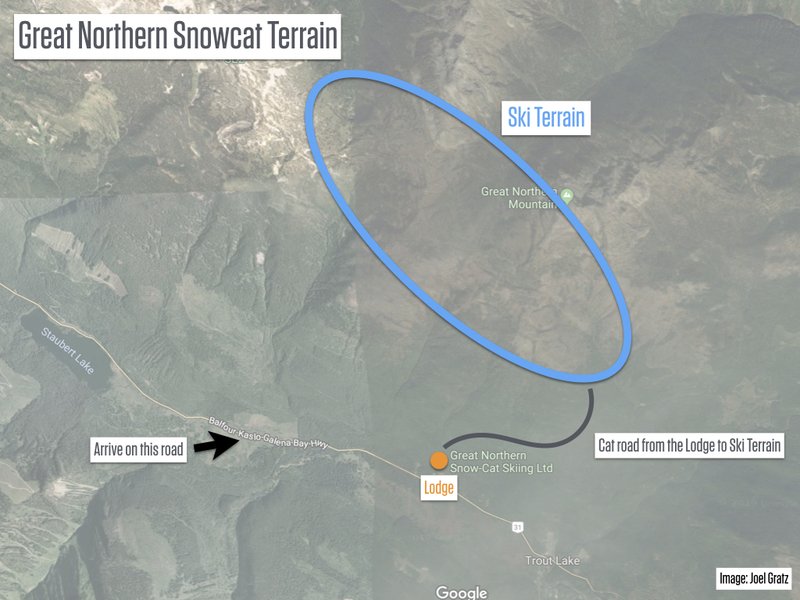 * During our trip from January 11-13, 2019, not all cat roads were built across the terrain, which meant that we didn’t have the option of skiing some zones. This seemed strange because the snowpack was near or above average during our visit, so I am not sure why more of the roads were not built. * Most runs were on the shorter side, between 700-1,000 vertical feet. 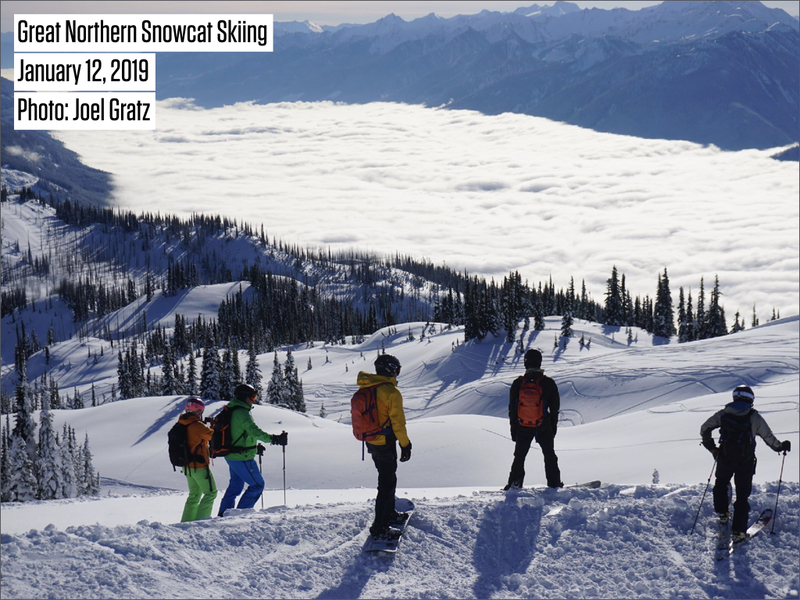 This could be great for intermediate or low-advanced backcountry powder skiers but could leave more experienced skiers wanting a bit more. The upside was that even if someone fell or was slower, there was not a long wait to get everyone back together at the cat. * To piggyback on the above, total vertical for the day was between 6,000-10,000 feet. I never felt like I wanted or needed more, and the guides emphasized that they were after a fun, quality experience and not out to maximize vertical feet, which I appreciate. This amount of vertical might leave some more experienced skiers wanting more. 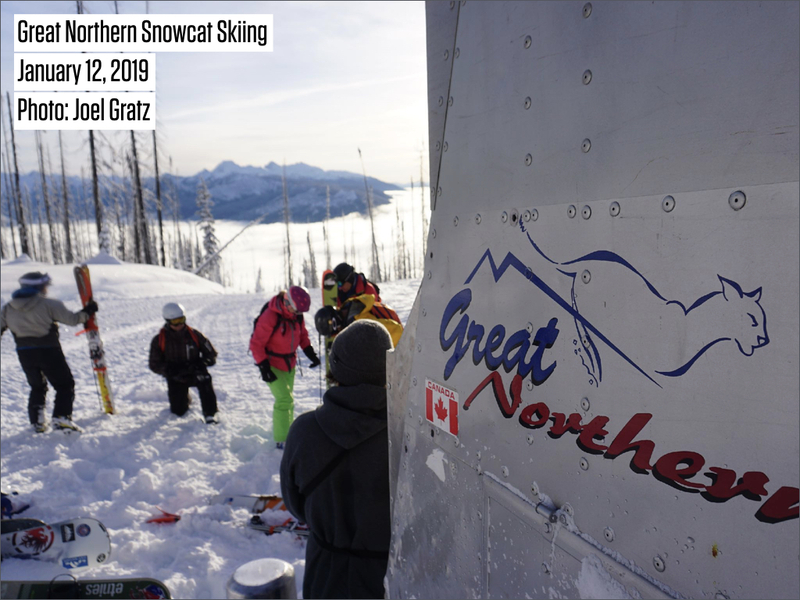 Great Northern is a top rate operation. The lodge, the food, and the guiding (all things that they can control) are done very, very well. 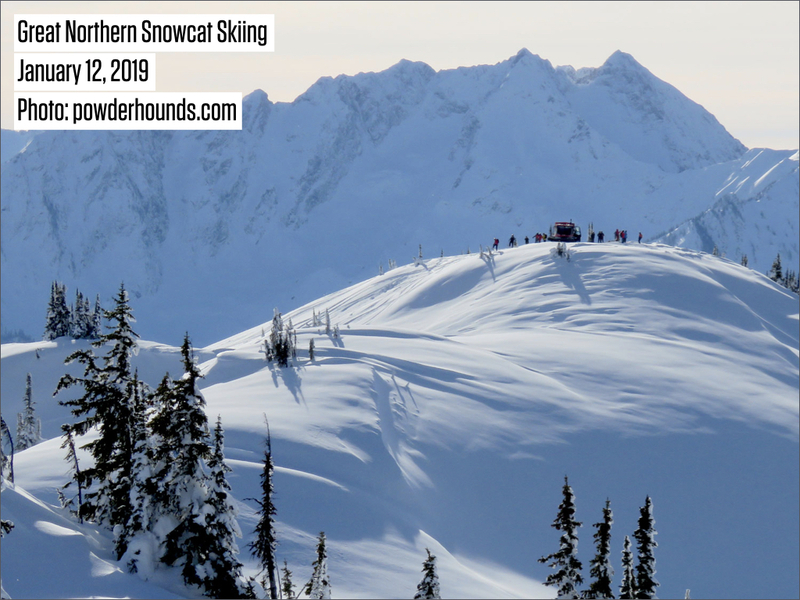 The relaxed nature of the trip, plus the shorter runs and total vertical, make Great Northern the perfect place for someone that doesn’t need to maximize their vertical and wants a fun, relaxed experience, or for a group of mixed abilities. 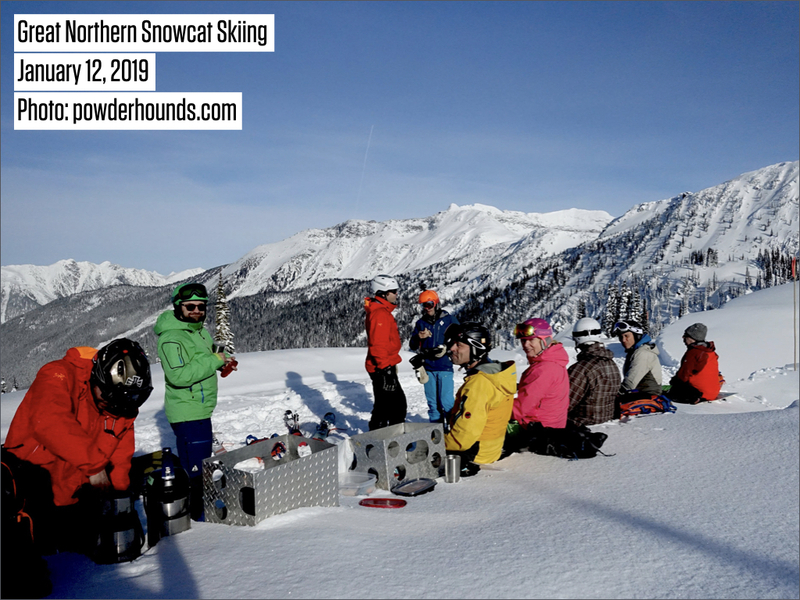 If you or your group are looking for more challenging and/or longer terrain, Great Northern might leave you feeling happy but needing a bit more. 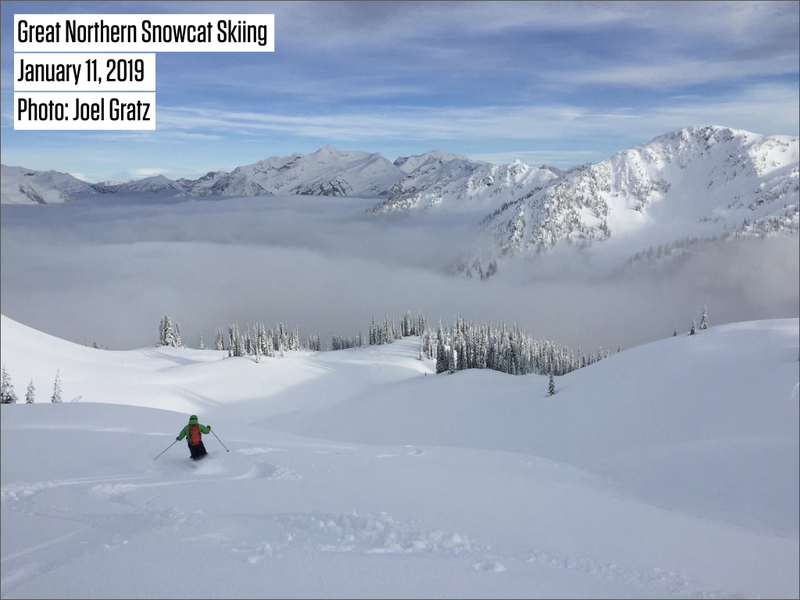 Please remember that this review is based on my three days at Great Northern in January 2019. 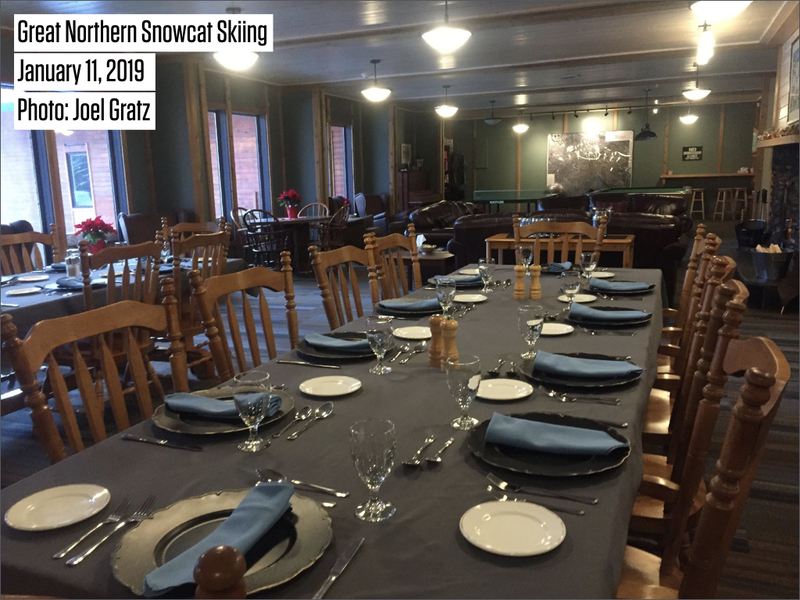 Your experience will likely be at least somewhat different due to your group size, the weather, and the snow conditions. 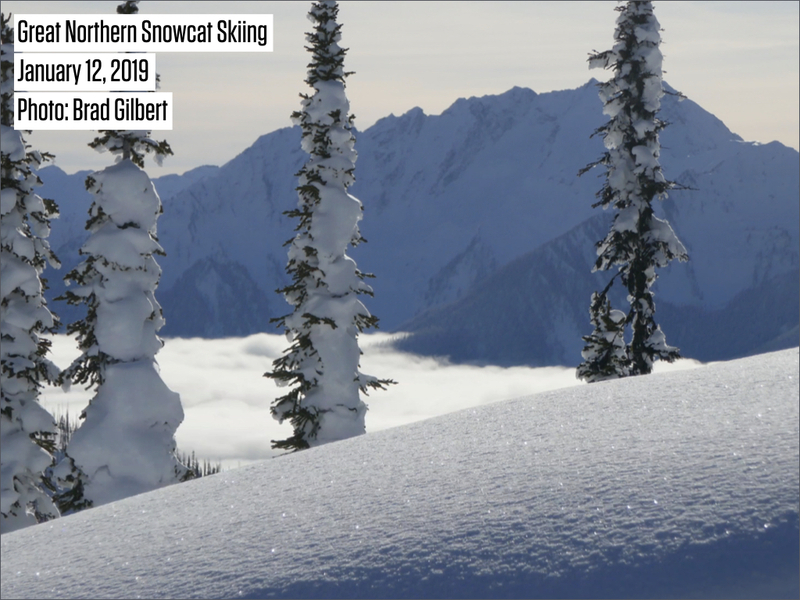 Also, for reference, I am writing this from the perspective of someone who grew up skiing in the eastern United States, has been skiing powder in and around Colorado for 15 years, skied with four cat ski operations in Colorado, and skied with four heli-ski operations in Canada. I hope that helps to put my views into perspective! Thanks for reading, and scroll down for a few more links and pictures!